NOTE: Due to Google upgrading Picasa to Google Photos, many of our old photos are now broken. We are actively working on fixing this – thanks for your patience! Visits with good friends and family that live afar are so special. But they always feel too short. It was wonderful to have Lynne here, but she needed to get back to Nyack to continue the transformation of her life without Ed. She just returned from five weeks in New Zealand with her friends there. Lynne lived in New Zealand from the mid-1970’s to 1990, so many of her friends from her adult life are there. In addition to living there, she and Ed spent a great deal of time in New Zealand during the 17 years that they spent sailing around the world. 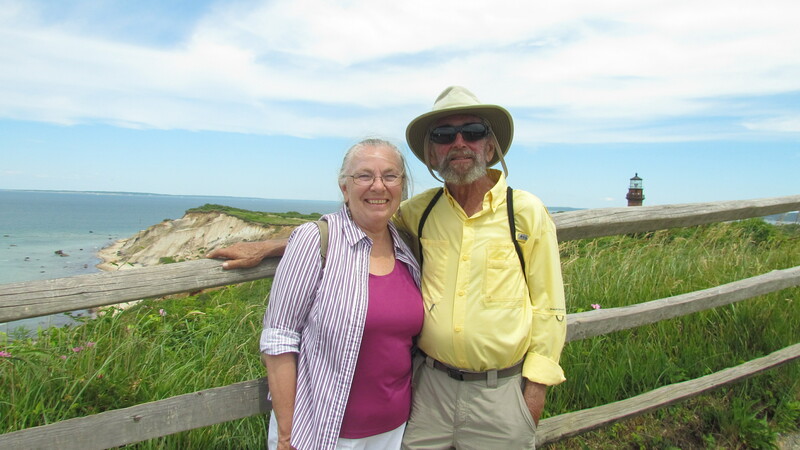 So it is very much home to Lynne and she hopes to return there for a few months each year during North American winters and New Zealand summers. She will become a New Zealand snowbird. But now she needs to figure out the rest of her year. Her family lives in Michigan, so she is going to start there. It is time to pack up her belongings in New York and head to Michigan. So off she went and I got a text saying she got home just fine. Tomorrow she will begin the readying for the move to Michigan. It will be harder for us to see each other as Michigan is not just a four-hour drive, but we talked about doing some travel together. That will be exciting to plan and to do. Before her departure, we had a great morning together. We went to visit with Heather, Jed, and boys as she hadn’t seen them since Mark’s memorial. Then we came home to have breakfast with Karen Baranowski as I wanted two of my good friends to meet each other. After Karen left, we walked my daily mile together, and then off Lynne went. 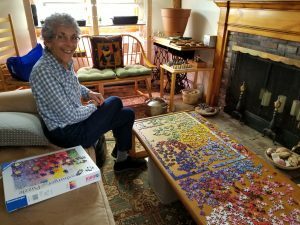 It felt very lonely here, but I did my exercises, iced my knee, worked on that puzzle, and did some indoor gardening. I put the little plants I have been growing outside to harden them up a bit before transplanting and planned what I will plant next. Tomorrow Heather is planning to plant some things in her garden, so I will head over to see if I can be helpful. I also need to prune the raspberry plants. I should have done this during the winter, but somehow never got around to it. Tomorrow is the day. Rain is expected in the afternoon, so hopefully we’ll get an early morning start. Lynne arrived from Nyack at 1:00 this afternoon. Yea, yea, yea! It is wonderful to have her here for a couple of days. I put her right to work on my latest puzzle and I’ll bet she finishes it before she leaves on Saturday. We spent the entire afternoon and evening just catching up and will probably continue to do the same tomorrow. All I got done today was C & C–cooking and cleaning. I wanted to make a casserole to take to my friends Olivia and Terry White as Terry is having a surgical procedure done on his back tomorrow. And as long as I was in the kitchen doing that, I decided to make soup as well. Nothing exciting, but between that, walking and exercising, and doing a bit of house cleaning, the day was over. I did have a nice visit with Olivia and Terry when I delivered the casserole and then I spent my whole evening trying to get the border of a new 1,000 piece puzzle done. I’m almost there, but I’ve decided to stop and let my friend Lynne complete the job when she gets here tomorrow. Looking forward to her visit! This is my week to deal with the results of filters that have not been maintained properly. On Saturday I noticed that the filter in the fish aquarium needed to be changed, but I ignored it. Sunday night when I got home from Heather and Jed’s there was a flood of water between the dining area and the living room seeping into the living room area rug. I saw that the water was coming from the aquarium and I immediately surmised that the aquarium had sprung a leak. But on closer inspection, I saw that the filter was backed up with water that was spilling over the top of the aquarium. It took three big towels to soak up the water and a lot of time to unplug the filter to take it out of the aquarium to clean it properly. On Monday, the kitchen faucet starting squirting water out of a small pinhole in the top of the faucet. That only happens when the filter inside the faucet needs cleaning. Then I started having trouble with the polar ice machine that I have been using to ice my knee. It was just not staying cold. It was not until this evening that I finally read some small print that said that there is a tiny filter that has to be routinely cleaned. Of course! I found the little piece of foam, about the size of the tip of my little finger, removed it, and found that it was totally covered in slime. Yuck. I cleaned it and put it back in and instantly, I had a cold pack again. So, lesson learned. Filters require maintenance and I need to be more proactive. Other than dealing with filters, I did make some progress on my To Do list and I made a first stab at doing my taxes. I have more questions than answers and need to find someone that can help me. But I’ll get there. Then I picked Ollie up from school and did a lot of walking while he rode his new bicycle. It was partly sunny today, but it felt really chilly. I am hoping warmer days are coming in the near future. For the past four weeks, my total focus has been on recovering from my knee replacement surgery. Recovery will continue for months to come, but if things continue as they have, it is time to adjust focus and get back to life as usual. I will continue to go to physical therapy for at least five more weeks and need to spend part of each day doing the therapy routine at home plus walking, walking, walking. But in addition, I will try to start working through my To Do list. Today I had PT early, came home for lunch and a little recovery time, talked to Lynne Kirwin who is coming to visit on Thursday, and then did some research into what I will be getting Ziggy for his birthday that is coming up in less than two weeks. Then I headed to town to run through a long list of errands. When I got home, I wrote an email to Justin and Jo outlining my thinking about Ziggy’s birthday. I sent the email by accident before it was completed and before I could finish a second email, Justin called and we went through the pros and cons of my different ideas on the phone. That was it for today. Tomorrow’s project is to work on filing taxes. Mark did this for all of the years we were married, and H&R Block did it for me the past two years. I’m hoping to do it myself this year, but if not, I’ll head back to H&R Block. Today was Ollie’s birthday party with his friends. 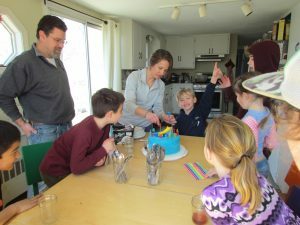 He chose to take a small number of friends to the Cape Codder Indoor Waterpark in Hyannis, so they gathered at noon to have pizza and birthday cake and then Heather and Jed took off with the five first graders plus Jonah and Sam. They needed two cars since the van still has the spare on, so I offered my car and I stayed behind and took advantage of the Goldstone laundry facilities for the afternoon. I also took a walk but unfortunately waited until the wind blew in the clouds, hiding that beautiful sunshine. With the wind, it felt so cold that I only made it a half mile this afternoon. If it is still cold and windy tomorrow, I’ll go to the community center and take advantage of the indoor walking track that is available to the public from 11:00 to 12:00 each week day. 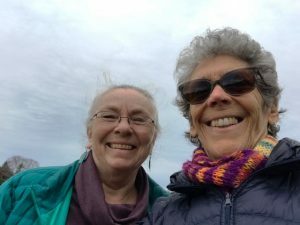 Later in the week it is supposed to warm up a bit and I am looking forward to some long walks with good friend Lynne Kirwin who is coming to visit. I can’t wait for her arrival on Thursday. Back to the birthday party, Heather and Jed served homemade pizza and then the fantastic cake Heather made. It is called a rainbow cake and looks too beautiful to eat. 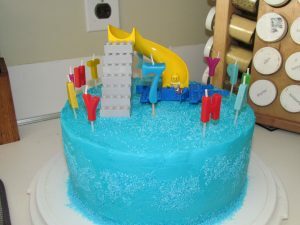 She made the cake yesterday and then put the blue icing on this morning making it into a water slide. I knew the two boys Ollie invited, Raylan and Grayson, as we spent our mornings at swim lessons together last summer, but I had never met the two little girls, Grace and Peyton. What a group of delightful personalities! 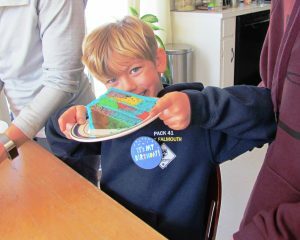 They have been learning at school about how important it is to eat the rainbow. This means eating colorful vegetables. 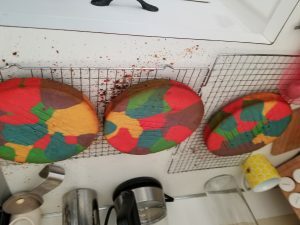 But when they saw the rainbow cake, they immediately joked about eating something not so healthy and getting away with it by saying they were eating the rainbow. And evidently in addition to dynamic personalities, they also had a lot of energy as Heather came home from the water park exhausted. She was the only adult in the water with the seven kids and they gave her a run for her money! But they had a great time. Ollie was very happy with his birthday celebration. What a lovely day that ended with an unexpected Saturday night date with my daughter and grandson. I stopped by Heather’s late in the afternoon to get some help with set-up of my new phone. 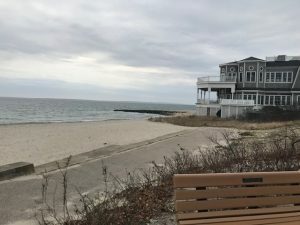 Jed was just leaving with Ollie and Jonah for a Scout campout at the Buttonwood Zoo off-Cape, so that left just Heather and Sam at home. Sam was planning to cook steaks on the grill for dinner and he invited me to stay. I had no other plans, so I accepted. And then after dinner he wanted me to stay to watch a movie. He changed what they were going to watch to introduce me to Harry Potter. I have never read the books nor seen any of the movies, so Sam wanted to fill the gap in my ‘cultural education’. For dinner, Sam did a great job grilling the steaks and Heather added boiled potatoes, asparagus, and salad. Delicious. It was a delightful evening. There was only one low point when Heather got a call from Jed saying the van had a flat tire on I 195 . . . not really where you want to have a flat tire with two little boys in the van. But he got it changed and they were once again on their way to the campout. Sure hope the rest of the evening went smoothly for them. I had PT this morning and am told that my knee has great flexibility but that I have a little more work to do to get it straightened out completely. It will go flat against the table with some work, but not just automatically, so more exercises were added to deal with that. I then went to the Falmouth School District Science Fair to see Sam and Jonah’s projects. By the time I got there, the judging had been completed and the boys weren’t ‘on duty’ by their projects as they had already been there for a couple of hours and were now enjoying some of the other activities. Sam did an experiment with yeast with two friends, Ethan and Karl, and he and his friend Robert had their underwater ROV that they built together on display. Jonah did a survey project with two friends, Kayden and Lucas, about favorite pets. I caught Jonah at his display just long enough get a photo. I then went home for lunch and to rest my knee and later in the afternoon I visited with friends Karen and Peter Baranowski. It was a busy day. Tonight I’m singing the ‘Cell Phone Blues’. I babied my cell phone until it just wouldn’t do the job anymore and then switched to Mark’s old cell phone about a year ago. It was a much better phone than mine, but also much older. And the transfer was painful. The AT&T guys told me at the time that I really needed to buy a new phone, but I ignored them. Since then, Mark’s phone has worked for me, but there was a problem in keeping it charged. And this morning, after being plugged in all night, I opened my email and the phone went black. It had turned itself off. I turned it back on and saw it had no charge before it turned itself off again. I plugged it in quickly and waited for it to have enough charge to function. I would turn on but there were constant pop-ups saying that this or that was no longer working. These little pop-ups had an OK button, but when I clicked on OK the pop-up would go away for a second and then pop-up again. If I got a text, I could click on it to read it, and work very hard to send an answer in between pop-ups. I tried shutting the phone off and on various times, but the problem just returned each time. It was time for a deep breath and the thought that maybe I really did need to buy a new phone. I did a search on my computer to find the recommended phones, searched Amazon to find the best prices, and decided on a particular mid-level Samsung Galaxy. I printed out the information and headed to the AT&T store. I think Mark bought this phone in 2011 and paid a fortune for it. I remember when he returned from the AT&T store with it and told me the cost. I was flabbergasted and just didn’t understand why he wanted to upgrade from his old flip phone. It took me another few years to move to a smart phone, but I paid significantly less for mine. Anyway, when I got to the AT&T store, the agent really tried to figure out my problem, but he made no progress. He finally suggested a new phone, listened to my requirements, and made some suggestions. I asked if he had the phone I had found on Amazon and, yes, he did. But it cost double to buy it in the AT&T store, literally double. When I showed him the Amazon print-out, he suggested I go home and order it online. But before heading home to order a new phone, I made a stop at Walmart. It was such an ugly day that I decided to do my daily walk-about in the store instead of outside! Never thought I’d become a Walmart walker, but here I was. While walking every isle, I came to the electronics area and decided to see what they had for phones. The phone I wanted was there and was the same cost as on Amazon. Bingo! Getting the low price meant I had to buy in on a Walmart installment plan, but the salesman said I could then take it directly to the AT&T store and pay for it in full. So I did. I have miles to go to get all of my apps back up and running, but at least I do have a phone. My goal today was to make a number of important business phone calls, but that didn’t happen. Hopefully, I’ll learn to use this new phone and get back on track on Monday. It was a busy day. I started with an early morning physical therapy appointment. The therapist gave my knee a good workout and declared that I am doing great. 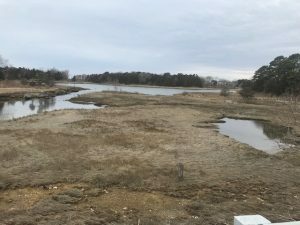 I left there and drove to Hyannis for my post-surgery doctor appointment. X-rays were taken to document the state of things and the doctor said the x-rays look great and that he is very pleased with my progress. If things continue to go smoothly, I won’t need to see him until this time next year. While in Hyannis, I did a run to Trader Joe’s and to Whole Foods before heading home. When I did get home, I had time to eat a late lunch and put my knee up for a bit before heading out to pick Ollie and Jonah up from school. Today was Ollie actual birthday and he wanted to play on the playground after school, so we did. Once Heather got home, I headed home to fix a quick dinner and then I returned to go with Heather and boys to an Open House at Sam’s School. 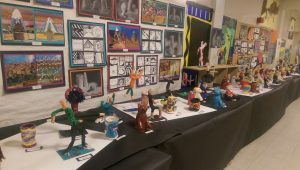 Student art lined the hall walls and ceramic and paper mache art pieces were displayed on tables. 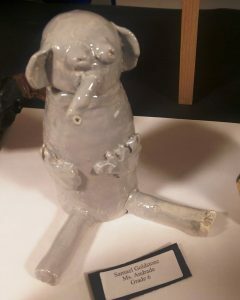 Sam took me on a tour to see his pieces—a ceramic elephant, a pattern painting, and a 3-D chart art piece. 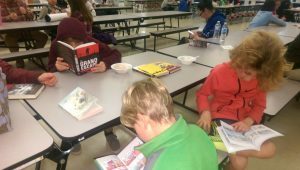 We went to the Book Fair that was part of the Open House and then the boys had an ice cream sundae while reading their new books. Thankfully tomorrow should be a little quieter, but it was good to be out and about.